You might want to pre-order developer Bioware's Dragon Age 2 now if you're intending to pick up the game when it launches this March. Why? Because if you do, you'll get a 'free' upgrade to the Signature Edition. And what do you get in said Signature Edition? “The Exiled Prince” DLC pack, the game’s digital soundtrack and an exclusive in-game digital armory featuring a variety of in-game weapons. Not that you'd want to miss out on free content, but if you just pick up the game on launch day you can still get the added stuff in the form of DLC, it'll just cost you 560mspts. “The Exiled Prince” introduces the noble archer Sebastian Vael, with players joining him in the middle of his quest to avenge the brutal murder of his family. Sworn to the priesthood as a boy, Sebastian is forced to re-enter the viper's nest of princely politics when his family is brutally murdered, leaving him as the sole surviving heir. Banding together with Sebastian and his unshakable loyalty and excellent aim, players will choose to either avenge Sebastian's murdered family to reclaim his title or direct his holy vengeance on their enemies in Kirkwall. In addition to this action-packed storyline, players will also be able to enlist Sebastian as a follower throughout a majority of Dragon Age II. 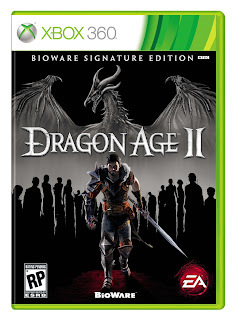 One of the most anticipated games of 2011, Dragon Age II, has been hailed as “An Epic…” by Game Informer magazine, “brutal and incredibly satisfying” by IGN.com and “Bloody as Hell… by 1Up.com . Dragon Age II will be available on the PlayStation®3 computer entertainment system, Xbox 360® video game and entertainment system and PC in North America on March 8, 2011 and in Europe on March 11, 2011. For more information on Dragon Age II, please visit www.DragonAge.com, follow the game at twitter.com/dragonage and on Facebook at http://www.facebook.com/DragonAgeOrigins.